Rear end collisions are extremely common, often resulting in serious injuries. In fact, the National Transportation Safety Board reports that there are roughly 1.7 million rear-end collisions in the United States every year. Even small fender vendors end up costing drivers millions of dollars every year. Because these collisions are so common, they often result in very similar injuries and damages. The most common injuries are described below. Back injuries resulting from rear-end collisions vary widely in seriousness. They can be minor and last just days or weeks, or affect you for the rest of your life. The force of the impact of this type of collision can compress your spine, which may harm your vertebrae and discs. Disc herniation is common after a rear-end collision. Spinal cord injuries are also relatively common. If your spine presses on the nerves in your spinal cord, it can result in pain, numbness, and even the inability to move other parts of your body. Whiplash occurs when your neck is stretched to its capacity and then quickly contracted frontward and backward or from side to side. It is r the most commonly cited injury resulting from rear-end collisions. Roughly 20 percent of the individuals involved in a rear-end collision will suffer from whiplash injury. Whiplash injuries can damage ligaments and tendons in your neck. Pain can last just a few weeks or even more than a year in severe cases. Your mind and body will instinctively try to protect you in a rear end collision. This often means you may try to stop yourself from moving forward by placing your hands on the dashboard or seat in front of you. The force is usually too much for your body to handle, which leads to broken bones, sprains, and other injuries. In some situations, the force of the impact may lead you to hit your head on the steering wheel, dashboard, or chair in front of you. Even if the airbags deployed, you may still end up striking your head on something that can cause serious damage. A head injury often results in loss of consciousness, concussions, lacerations, bruising, and swelling. Head injuries should always be taken seriously, and you should seek medical attention as soon as you can after the accident. You should always wear your seatbelt every time you get into the vehicle, but the nature of rear-end collisions make seatbelts somewhat dangerous. The most common injuries associated with belts are bruising and lacerations, but seatbelts have been known to cause internal injuries as well. Regardless of the seriousness of your rear-end collision, it is a good idea to seek medical attention after an accident. It is not only important for your health and safety, but it may also help your personal injury case. Property damage: If personal or real property is damaged as a result of an action of the defendant, the plaintiff can include a claim for property damage. Medical costs: Any out of pocket medical bills should be reimbursed as part of a lawsuit. If an insurance company paid medical bills, they may assert a right to be reimbursed out of the proceeds of any personal injury settlement. Pain and suffering: This is meant to address the physical, mental, and emotional anguish that comes with being the victim of an accident. In many cases, the path to rehabilitation and recovery is difficult, painful, and frustrating. A victim should be compensated, at least in part, for the interruption of their lives. Permanent injury: Often, despite the doctors’ best efforts, a patient is left with permanent pain or the loss of function of a body part after treatment is complete. Even though it is impossible to assess the value of this monetarily, the courts will try their best to put a number on it and compensate plaintiffs accordingly. Lost wages: A claim for lost wages seeks to recover money for any work that was missed as a result of an injury. The lost work may have occurred immediately after the accident, or may have accrued over a period of time, including any days missed to receive treatment. Loss of consortium: After a serious injury, many aspects of a victim’s life change. If his or her ability to be intimate with a spouse is affected, a claim of loss of consortium may be included in the complaint. It does not matter if the problem is a physical one or a psychological one. Call and let us know if you have any further questions at 470-239-8837! 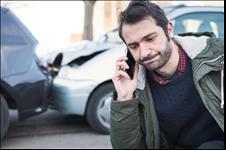 If you have been involved in an automobile accident, you may be seriously injured and not even realize it. At least, not immediately. Serious injury can occur even in slow or low-impact collisions, and accidents which cause no damage to the vehicle. For example, accident victims can suffer from “whiplash” in collisions involving a sudden change in vehicle speed of just 2.5 miles per hour. If you are injured in a motor vehicle accident and the other driver does not have insurance company, the best case scenario is that you carry uninsured motorist (UM) coverage. UM policies exists for this particular type of accident scenario. Your UM coverage will help you pay for expenses resulting from bodily injury, including emergency room treatment and follow-up medical care. UM coverage is something that you pay your insurance company for to protect yourself from uninsured drivers. Unfortunately, it can still be a fight to get those benefits paid out should you ever need them. Distracted driving has emerged as a disturbing trend that poses a serious threat not only to preoccupied drivers, but to other motorists on the roadways. Accidents caused by this unsafe practice have seen a major uptick in recent years due to the widespread use of smart phones to text and post to social media platforms, such as Instagram and Twitter, while driving. Although drivers of all ages may be guilty of driving while distracted, studies have found that teenage drivers are especially tempted to use their phone to snap photos or text from the driver's seat. Personal injury lawsuits on the basis of distracted driving are becoming more prevalent. A wrongful-death suit against taxi-alternative company Uber cites distracted driving as the cause of a collision that killed a 6-year-old girl and injured her mother and brother while they were crossing the street on New Year's Eve in California. If you have been injured in an accident, the consequences can be long lasting. In addition to pain and suffering and medical expenses, you may be unable to work or provide for yourself and your family. That's the bad news. The good news is that you may be entitled to meaningful compensation if the accident was the result of the negligent or reckless conduct of another person. In order to determine if you have grounds for a lawsuit, however, it is crucial to engage the services of an experienced personal injury attorney. The Law Office of John Q. Vaughan Has Exapanded!